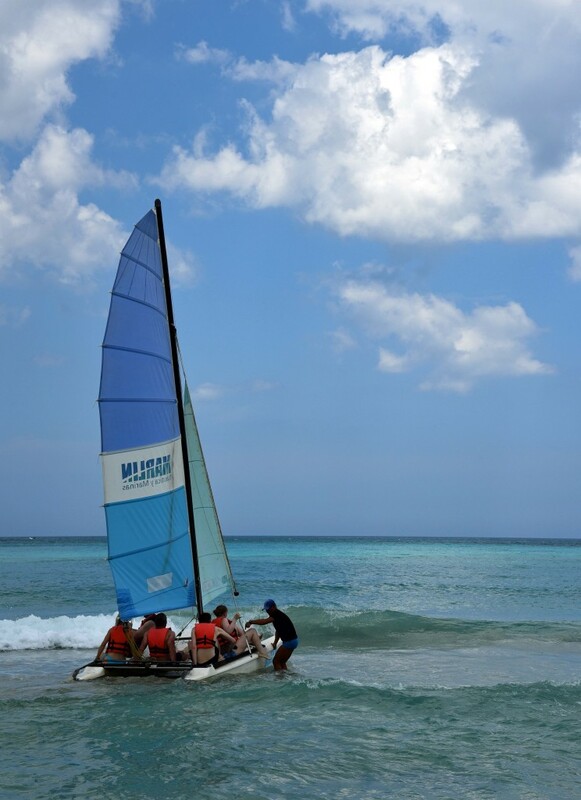 CUBA: THE TIMELESS "PEARL OF THE ANTILLES"
Contact Us to Organize a Tour for Your Private Group! Cuba. A magical place. For the past 55 years it has been a land of mystery to Americans. But that is changing. 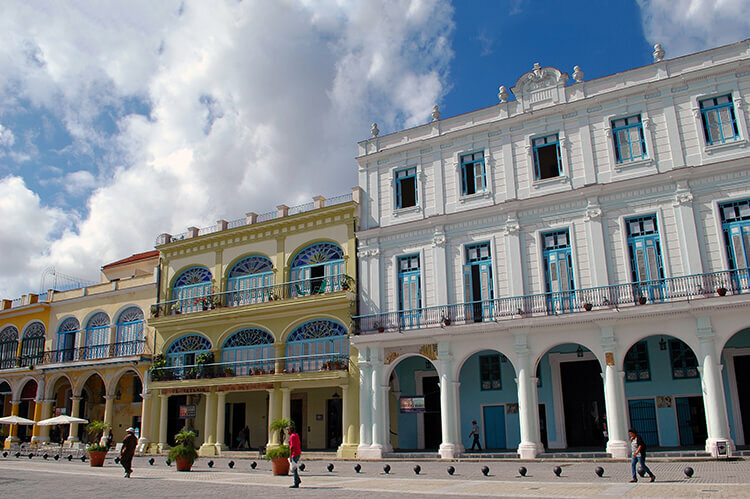 And Essential History Expeditions’ Cuba tours enable guests to explore this jewel of the Caribbean. From the revolutions of Jose Marti and Fidel Castro. To the writings of Reinaldo Arenas, Gertrudis Gómez de Avellaneda, Alejo Carpentier and Ernest Hemingway. From the art of Wilfredo Lam, Manuel Mendive and Alberto Korda. From the hot music scene of Havana and Santiago with the son, mambo, salsa and more to classical guitar and piano. From white sandy beaches and the clear turquoise waters of the Caribbean to soaring green mountain jungles. From small hamlets to towns of still-perfect 18th century colonial architecture to modern metropolis. We will explore all this and much more. Our sample Cuba tour includes eight days and seven nights of fully guided people-to-people contact filled with history, culture, music, food, in cities, towns and beautiful rugged countryside and pristine beaches. 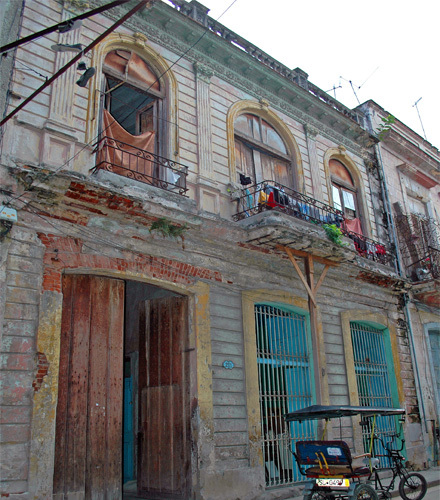 Under U.S. travel restrictions, the American traveler cannot travel to Cuba for pure tourism. Further, new guidelines under the current administration will not allow Americans to visit Cuba without an authorized tour company. 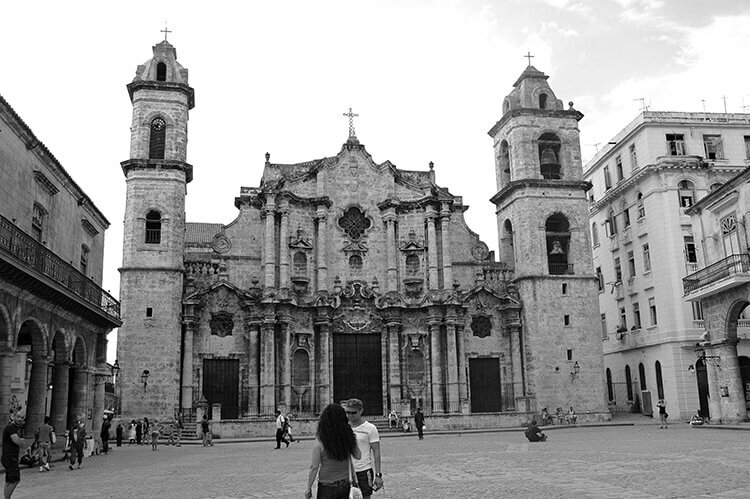 Essential History Expeditions is your Cuba adventure tour company! For every Cuba expedition, Essential History Expeditions takes care of the travel affidavit and Cuban visa, and we have developed our itinerary in conjunction with the official Cuban office, Havanatur, as well as a longtime stateside Cuban agency in Miami. Essential History Expeditions has now led nearly 20 tours throughout Cuba since the easing of travel restrictions in December 2014. Some of these tours were larger groups with a set itinerary. Many, however, were private tours with customized itineraries. The following itinerary includes a sample of locations and activities we can customize for your specific group. We would love to customize an incredible journey through Cuba to inspire, inform and entertain your private group! Contact us by email or phone to get started! 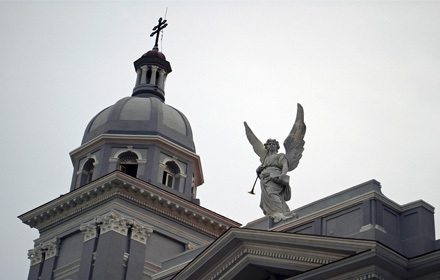 CHECK OUT OUR RECENTLY PUBLISHED ARTICLE ON CUBA, INSPIRED BY OUR FIRST CUBA TOUR! Essential History Expeditions partners Dr. Brian DeToy and Sheryl Rankin Shafer were recently published, along with several of Sheryl’s photos, in Destinations Travel Magazine! 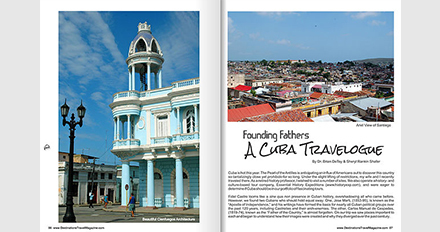 Check out the article entitled Founding Fathers: A Cuba Travelogue! The history of this island begins for us when the native peoples first met the Spaniards in the last decade of the 15th century. Over the next half-millennium, the island and people of Cuba would have much to say about what happened throughout the hemisphere. Spaniards, British, French, Americans and their allies all contested for control. The fates of empires hung in the balance as forces vied for Cuba. In the last half-century, the revolution led by Fidel Castro transformed the nation and people. Now, today, this emerald island is re-emerging as a destination for Americans seeking to explore its enormous riches in history, culture and geography. On our Cuba tour, we will visit the birthplace of revolutions – Santiago de Cuba in the southeast of the island, where the Americans landed to aid the Cubans in their fight for independence in 1898, including Teddy Roosevelt’s Rough Riders at Kettle Hill, and where Castro began his fight in 1953. 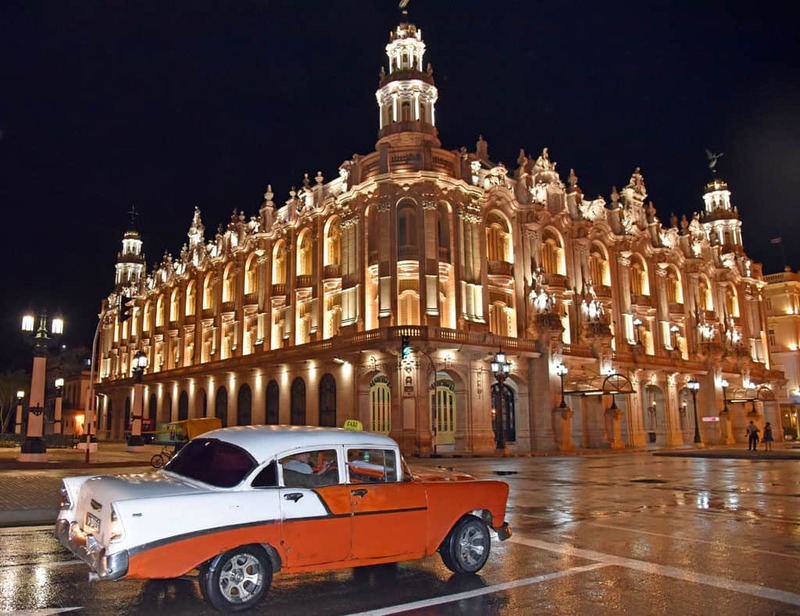 In Havana, we will see the whole panoply of old and modern Cuba on display. Small groups can choose between scuba diving, snorkeling, or swimming. We’ll take a day trip to the stunning Vinales Valley and the Benito cigar plantation along with hiking and cave exploring at Santo Tomas. On our Cuba tour, we’ll also visit the beautiful French city of Cienfuegos and the nearby 1961 Bay of Pigs invasion beaches. 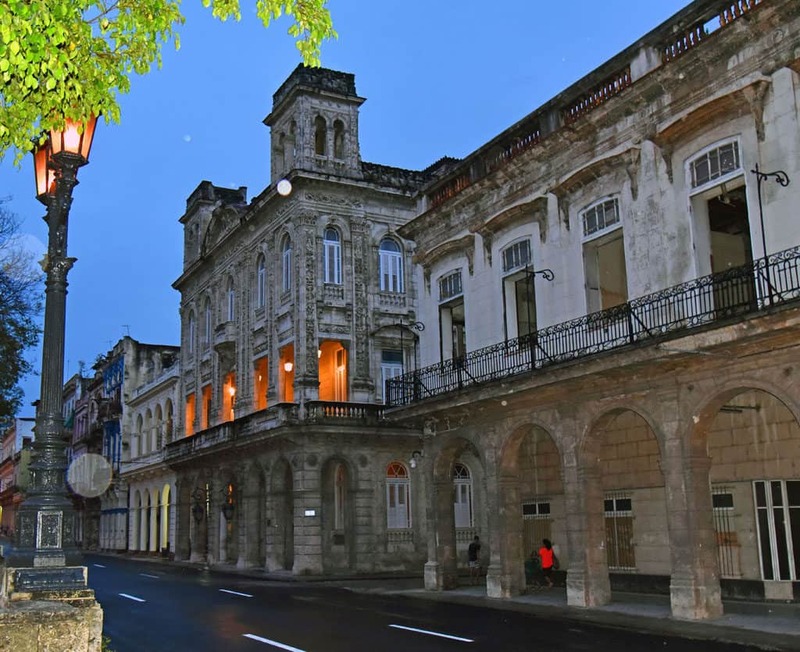 Throughout the Cuba expedition, our guests will experience incredible Cuban meals and music, art and architecture, along with lessons in history that resonate down through the centuries and decades with us today. 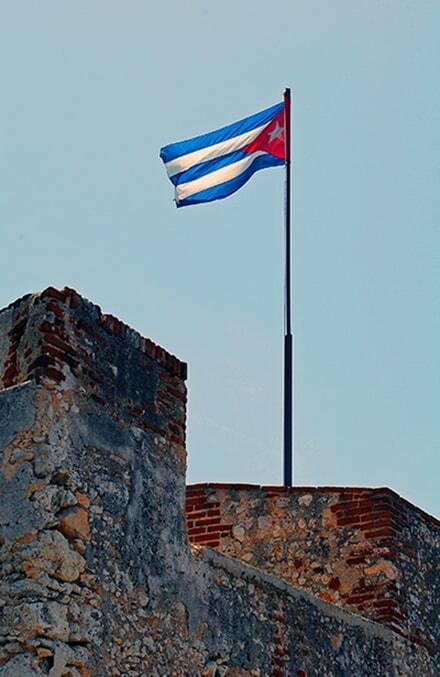 Visit one of the most iconic sites of the Cuban revolution of 1950s where it all began with Fidel Castro, the Moncada Barracks. 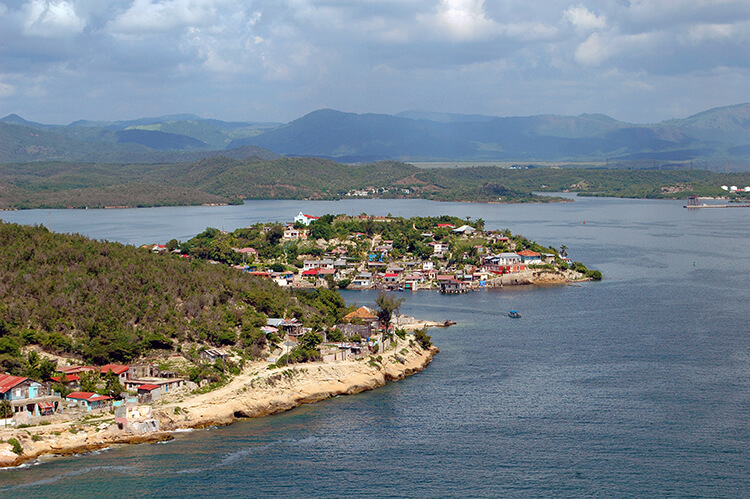 Moncada was the Batista army garrison that Castro’s band failed to seize. But in their failure they ignited a revolution and a movement. Visit numerous sites of the 1898 Spanish-American War, including Playa Siboney, Siboney Granjita Ranch, Las Guasimas, El Caney, Kettle Hill/San Juan Heights, and the Peace Tree – Teddy Roosevelt and the Rough Riders! 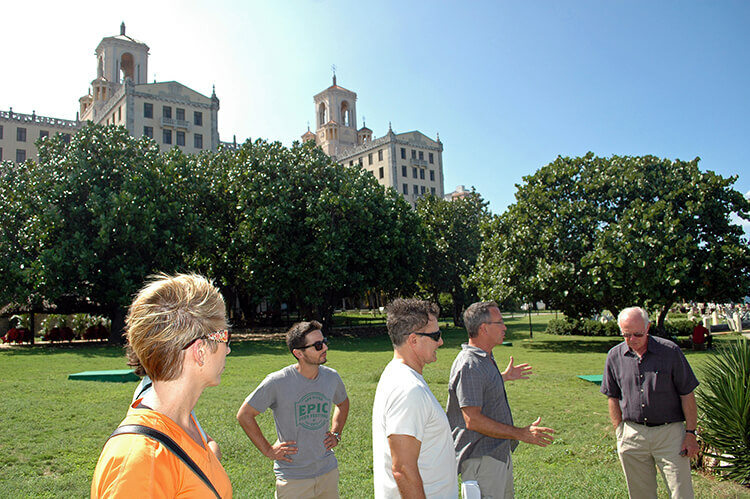 Walking tour of Old Havana (Habana Vieja) – the 4 Plazas, the Prado, Plaza Central – the heart of the City for 500 years! We will also pop in to some of Hemingway’s favorite haunts, including La Floridita, La Bodeguita and Sloppy Joe’s to sample the drinks he made famous: the daiquiri and mojito. 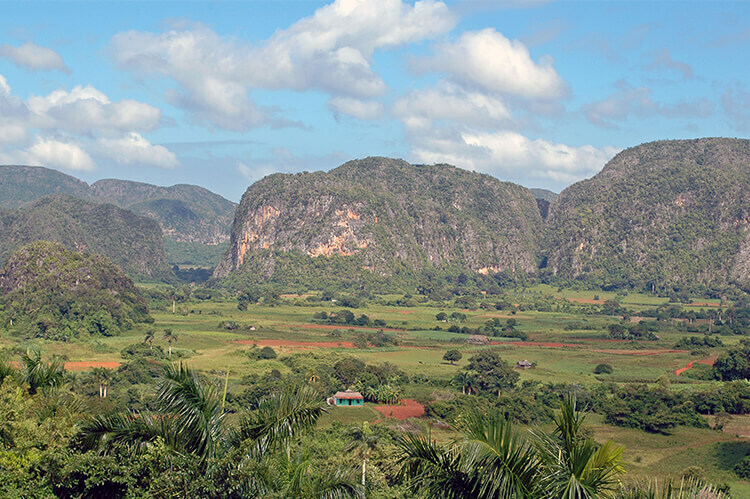 Drive through the western province of Pinar del Rio, the tabacco capital of the world! Explore the Bay of Pigs Museum (Playa Giron) and 1961 Invasion beaches, where American-backed Cuban expatriates attempted to initiate a counter-revolution and topple Castro. It failed. Spectacularly! Down payment: $1,000 per guest due upon registration; see Terms & Conditions for payment schedule and cancellation policy. Active duty and career retired military, current and career retired educators, and students all receive an automatic 10 percent discount. All repeat Essential History Expeditions guests receive a 10 percent discount.